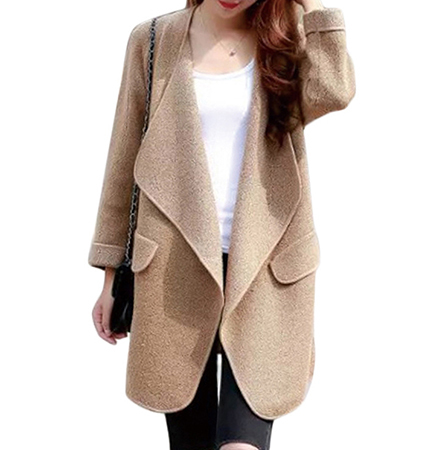 The exaggerated style of this cute, oversized coat is one that results in a warm, comfortable wear. It is presented in a lovely shade of light tan. The coat has long, wide sleeves that are cuffed at the ends. The length of the garment goes to the knees. It has two front pockets with flaps. The wide lapels ad a distinctive look. This is a loose-fitting coat that provides not only warmth, but the ultimate in overall comfort. We recommend dry cleaning only for this garment. It is available for purchase in sizes Small, Medium, Large and Extra Large.